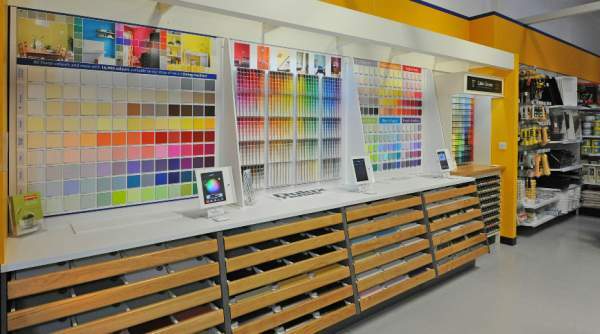 Our Decorator Centre in Farnborough is a Cane Adam showroom, modern and bright, featuring colour walls and brush-out boards. Here you’ll find a good selection of wallcoverings, trade and designer paints, decorating sundries and equipment such as ladders and steps. Our team is warm and friendly with a good sense of humour, and we’ll treat you to free coffee while you explore what’s on offer. We know our products inside out, so please do ask if there’s anything technical you need to know. Our showroom is on Hawley Lane Trade Centre in Farnborough, near Frimley. Look out for LOKnSTORE and the Formula One Autocentre off the B3272 near the M3 motorway bridge. There’s plenty of parking, including allocated disabled bays. Travelling along the Hawley Lane towards Yateley, the branch is on the right hand side. Heading towards Farnborough Gate the unit is on the left after the motorway underpass. Watch out for the storage building we are just after on the left. This branch opened in November 2013 and was created as a new concept store. The colour wall is an innovative way to display all our colours together making selecting the perfect colour less of a task. 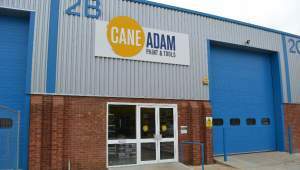 The new look for Cane Adam is bright and clean and sets the new standard for the chain of stores over coming years.